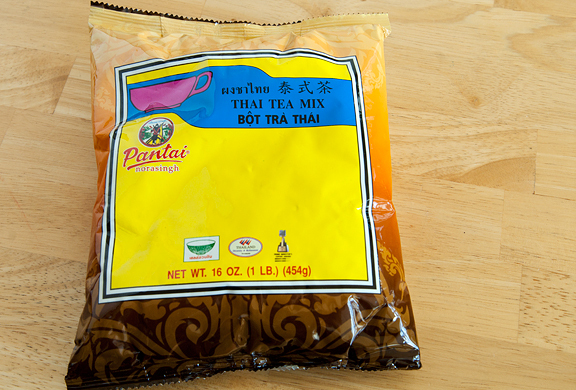 Before I forget, several of you had asked for a picture of the Thai tea I had purchased when I made Thai tea ice cream. Twist my arm! I went back to the store and bought a second bag just for you guys… ahem. Hee hee. But seriously, I get it because I can’t read Chinese (or Korean or Japanese or Vietnamese or Thai or…). The picture is always helpful. I’ll add this to the other post too, but here it is for those of you who were wondering. I’m sure there are other brands that are equally good. It’s getting a little toasty around here which means it is downright hot in Boulder and the surrounding flats. I’ve been avoiding the stove and oven for a good month now, but had to break down today in my quest to clean out my freezer. More on that (a little) later. Just three days ago we had cold, wind, rain and overnight we dipped quite close to freezing. I kinda loved it. I kinda had a craving for soup. Now, in the heat of late afternoon, I can’t think of anything other than a cold glass of ice water. Come evening, because of our (blessed) low humidity, our temperatures drop into the low 50s, sometimes 40s. It’s delicious and my brain lulls back into cool weather mode and thoughts turn to soup. I know – soup? In this heat?! 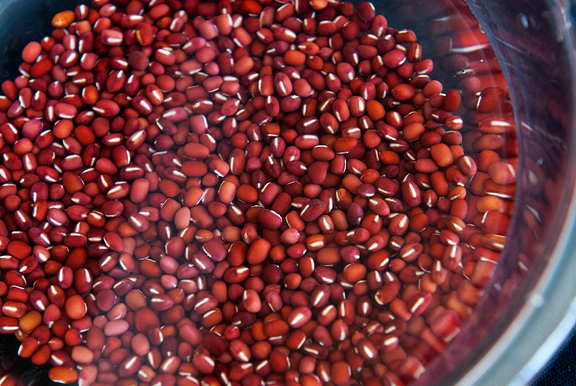 Make that red adzuki beans. I’m talking about a sweet soup. Most westerners are pretty underwhelmed by Chinese desserts. They don’t tend to be very sweet, but I rather like that. However, the marriage of Asian flavors with western style desserts is like the ultimate in awesome for me. When I dine in authentic Chinese restaurants in the Bay Area or Southern California, our complimentary dessert is almost always a hot bowl of some kind of sweet soup. Taro root, corn and carrot, red bean, green bean, black sesame, peanut… soup. When I was a little girl, my grandma made all manner of Chinese sweets from scratch because… there were very few to be found in southern Virginia and certainly none as good as Grandma’s. This sweet red bean soup was my favorite. A comfort food, if you will. And it’s simple to make. You could end it right there after adding sugar and run off with your bowl of sweet red bean soup. But there are options. I love having options! I like to blender my soup so it becomes thick. You can also blender half of it and leave half of the beans intact. My favorite addition is tapioca pearls. I love the little ones and the big ones… [Ask Jason about my obsession with boba “bubble” tea. How can you resist a drink that doubles as a choking hazard?] Grandma says to boil the little tapioca pearls separately and then add them to the soup. The soup can be enjoyed hot or cold. Right now, cold is the way to go for me. In winter, I love a hot bowl of this in the evenings after dinner. Considering it is mostly beans, it’s quite good for you too. Cold soups are appropriately popular in summer. This is a nice one to add to the mix. *Only use for pressure cooker method. Soak the beans in water overnight. Drain and rinse the beans. 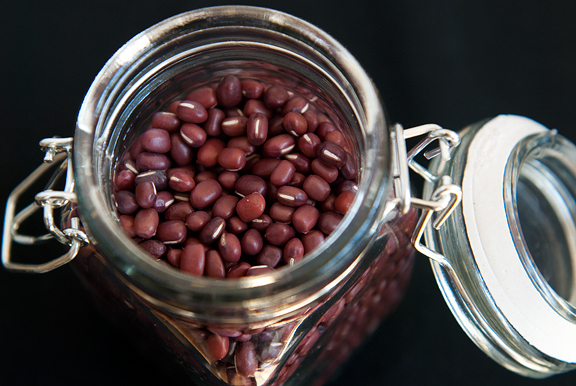 Conventional stove-top method: In a 3 quart saucepan, combine the adzuki beans with 8 cups of water and set to boil over high heat. When the water reaches a boil, let it continue for a minute. Reduce the heat to a simmer and cover the pan (take care that it doesn’t boil over – ugh, what a mess). Let the beans simmer for about 90 minutes or until they are soft enough that they are almost falling apart (I simmered mine for 2 hours, but I’m at elevation). Pressure cooker method: Place the drained soaked beans and 8 cups of water and a dash of unflavored oil (canola, vegetable, etc.) in the pressure cooker. Seal the pressure cooker and set to high pressure setting. Heat over medium high heat. When pressure is reached, cook for 5 minutes at pressure. Turn off the heat and leave the pressure cooker to release naturally (just let it decompress on its own). Both methods: While the beans are simmering or the pressure cooker is cooling, in a separate saucepan, boil 3 cups of water. 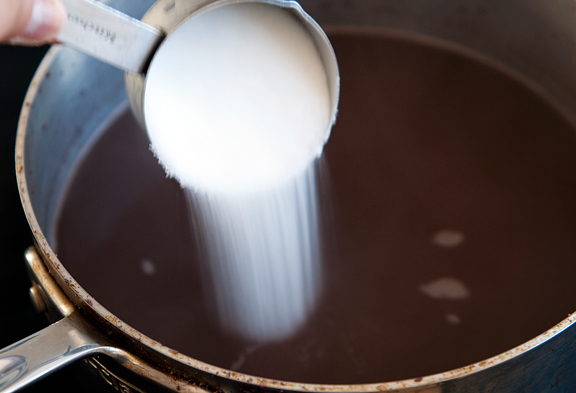 When the water comes to a boil, add the tapioca pearls and reduce to an active simmer. The tapioca pearls will eventually turn translucent. When they are half cooked, they will look like reverse tadpole eggs. When they are nearly done, the whole pot will look like a little galaxy of stars. Add more water if it boils down too quickly. When the white centers are almost gone (this took me about 25 minutes), you can remove the pan from the heat. 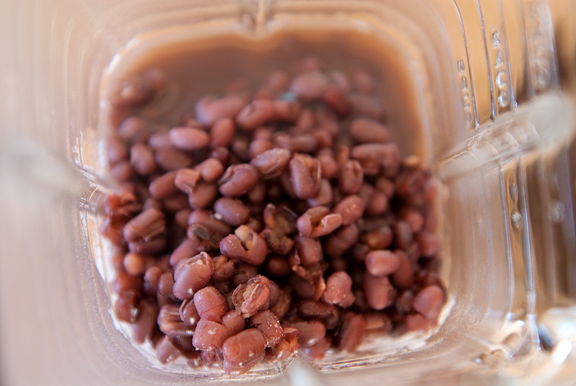 When the adzuki beans are done (or pressure cooker naturally released), remove from heat (or open the pressure cooker) and stir in the sugar. You can either leave the beans as they are, blender all of the soup, or only blender half of the soup/beans. Totally up to you. Stir the tapioca pearls and liquid into the soup. Serve hot, warm, or chilled. Serves 8. LOVE this. I also like the green mung beans for this desert too! Wow, this is certainly not in my normal frame of reference for desserts, but very interesting nevertheless! The cold soup looks like a great remedy for current weather. I’m craving for Thai milk tea now. Red bean anything is definitely in the category of LOVE. The simplicity of this means it’s a must-make! What a neat recipe! I love your description of the stages of doneness. Beautiful! Great recipe, hope to try this one very soon. Red beans are a favorite of mine. When baked into buns…ZOMG – get outta my way. Soup is off the table in this house until September, but I think this would be fabulous when it gets cooler. I’m more a fan of Korean melon soup after dinner when it’s hot. This dish (and many of your others) remind me of foods that I’ve tried as a kid, more or less forgotten as a young adult, and am now interested in reconnecting with as an adult(ish). I’ll be stopping by Asian Seafood Market on my way home this evening to grab some beans. Thanks, as usual, for the great recipes – and memories! Thanks for the recipe, I look forward to trying this. Hey Jen, a while ago I had a dream that I met you and we became friends. You even gave me many tasty things to try. But then it got out of hand and you wouldn’t stop feeding me and I had to run away. This is actually kind of a sad post for me because it reminds me of the time I got annoyed at my mom who kept trying to give me things to eat. This soup was one of them. I really regret it, but you’ve inspired me to try making this soup as an apology for my hateful attitude many years ago. I had something similar in Japan last month (although it was thicker, and in the form of a dessert). 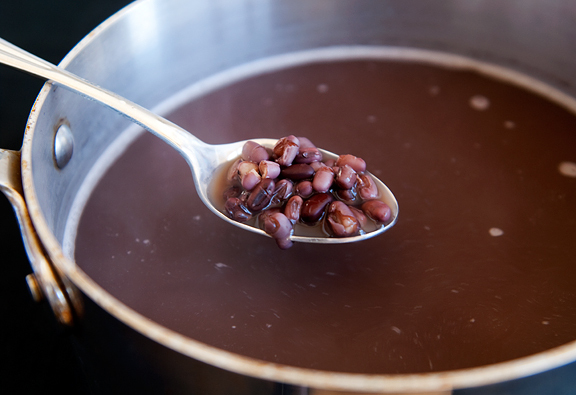 I love azuki beans, and a cold soup is great for summer. Yum! My mom made red bean soup all the time growing up and we love it cold in the summer! She also made green bean soup, which tastes very similar. Have you tried those red bean popsicles at the Asian markets? They’re REALLY good! Jen, have you tried to make popsicles out of the soup? I’ve done that and they are delicious. Great for summer eveings sitting on the deck and enjoying the red (or green) bean popsicles. Kids will come back asking for more. Yes I am a honky and have never seen this soup before. Looks really interesting! Hi Jen, do you have a recipe for the sweet red bean buns? I just love them and cannot get them here in Brazil – I would like to make them for myself! My favorite! I also love adzuki beans ice cream. Anything sweet with red beans is in my favorites list–this is a great dessert that I’m really excited to try!! Thanks for the tea info, Jen! I’m going to grab a pack of that right now. And this red bean soup looks so homey and comforting for winter in Australia right now. I like adding orange peel when I make this. Gives it a nice fragrance and flavor. Could canned bean past be substituted? You would have to adjust the sweetener, but I assume you could end up with something similar. Should the consistency be fairly thick or thin? Jason – hey, at least you didn’t have to do the Heimlich maneuver! Cookie – oh yeah, I love those things. My grandma and mom made them at home – slightly different from store bought, but still really good. Trolleira – That is on my list, but not until winter (I would probably turn homicidal making steamed buns now – it’s too hot). LimeCake – orange peel sounds lovely! Wend – You could try using the canned bean paste, but I think the texture would be very different and of course, the soup is half of the goodness (leaching the beans into the soup). The consistency is thick or thin, depending on how much you purée the cooked beans. It shouldn’t be difficult to find dried red adzuki beans in any Asian market though. I have always loved this soup as well as the red bean buns. 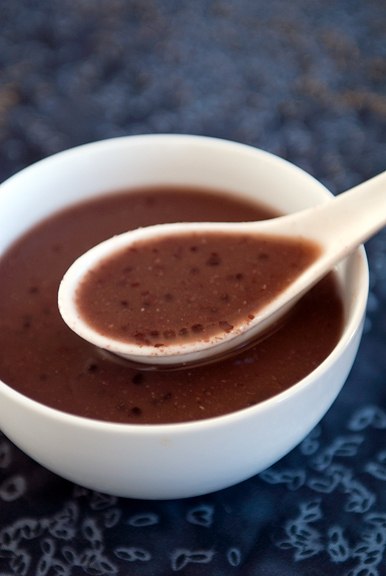 The highlight of every wedding banquet I went to with my ex, aside from the wait staff’s astonishment that a white girl was adept at wielding chopsticks, was when the red bean soup came out! I can’t wait to give this a try tomorrow, though I only have really big “pearls” at home. Hi Jen! I made your Taro Tapioca soup and it was perfect!! :D I love your website and photos. The photos are so beautiful and really is a great motivator, since I get hungry after seeing them. I followed your recipe for the sweet red bean soup and think I made a mistake somewhere. My result was about 11 cups of water with 1 tbsp of tapioca and red beans on the bottom. Was I supposed to drain the water at some point? Please tell me where I went wrong! Thanks! Susan – can you give me more details about HOW you cooked the soup and with what quantities? I followed your directions above with measuring cups/spoons and timer to be exact. I soaked the beans in cool water overnight. I drained and rinsed the beans the next day. In a medium sized pot, I put in 1 cup of beans with 8 cups of water and boiled it under high heat. When it boiled, I left it covered (with a tiny crack so the water wouldn’t overflow and boil over) for a minute and then turned the heat down to an active simmer for 2 hours. At 90 minutes, the beans were not falling apart yet. There was still a LOT of water from the 8 cups left. 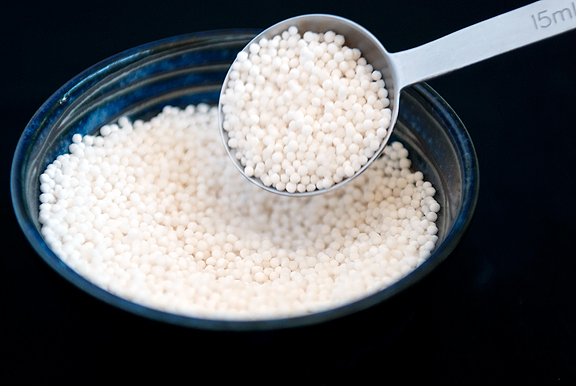 In a separate, smaller pot, I boiled 3 cups of water and added 1 tablespoon of tiny tapioca pearls. I lowered the flame to a simmer and cooked for 25 minutes. I had a lot of water left for this one too. I turned off the flame and went back to the azuki pot. The beans were done, but all the beans were on the bottom and there was a LOT of water left. It was not thick but very watery consistency. I stirred in sugar but it tasted like sugar water. I tried to blender the soup but that resulted in the soup exploding out of the blender as the hot air had nowhere to escape. I noticed that putting it in a food processor yields better results. I stirred in the tapioca pearls and liquid as it says above and had a taste. It was still sugar water. I couldn’t see any of the other ingredients – just dark murky water. On the plus side, I made more taro tapioca soup today. I’m really addicted to it now that I can make it myself. My parents, sister and in-laws all want me to make some for them now! Thanks! Susan – it sounds like the beans may not be right? Or perhaps you needed to continue cooking the beans until they were falling apart? I really don’t know. (If you blender soup, there is usually a little section in the lid of the blender that you can open up to let steam escape – OR you could let the soup cool enough so it doesn’t explode in a blender). The beans do sink to the bottom. If there is too much liquid, boil/simmer with the lid off. Sorry it didn’t work this time. Hmm… The packaging said Azuki beans and they matched the picture. The beans did fall apart. The skins were falling off. I guess I’ll boil it with the lid off next time. Thanks for getting back to me! I’m using this recipe in conjunction with the instructions a friend at temple told me to attempt my first ever red bean & peanut soup. Happy New Year! Wow, I like the idea of blending up half a batch to thicken! I think I’ll try that with my recipe when I decide to make it! :) Thanks for sharing! Definitely going to try this recipe soon! 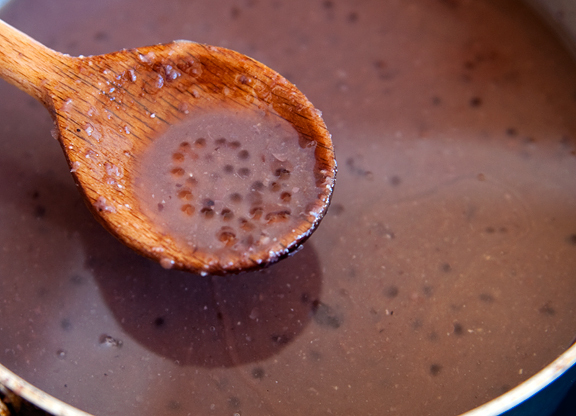 By the way, under the “recipes” section of the website, the small preview photo for the sweet red bean soup and the buns are switched. Thought you’d like to know. Thanks for posting the recipe. A very good addition to throw in is dried tangerine peels (widely available at Asian markets)…about 2-3 peels for the pot, I think. It adds a wonderful fragrance/depth of flavor. Also, my mom and aunties like to use rock crystal sugar as the sweetener (also widely avail. at Asian markets)–about 1/4 C and then more to taste. Sometimes I add a can of coconut milk at the end, right before serving. It’s really good. Another option that sometimes I go for is to add a bunch of pandan leaves while cooking the red beans. It’s wonderful. My favorite healthy dessert of all time!